I’ve long been curious about a little item that is always in the Regular Buy freezer section at Aldi. For $3.39 at the time of publication, you can purchase a cute 22-oz. Kirkwood Cornish Game Hen. It’s about a third to a quarter of the size of a regular whole chicken. It’s almost tiny enough that one hen could serve one person, if you fancy the idea of each person in your family or at your dinner gathering getting their own individual hen. I finally decided to go ahead and try the Cornish game hen. I bought two. I wasn’t quite going for the one hen per person thing, but I hoped that two hens would feed my family of four. One hen technically serves about 3.5 people, and one serving has 220 calories, 4.5 grams of saturated fat, 70 mg of sodium, 0 grams of sugars, and 19 grams of protein. It contains no artificial ingredients and no added hormones or steroids, although the law requires that all poultry in the U.S. be hormone free, so that label does not mean much. The hens are hatched, raised, and harvested in the U.S., although the package does not indicate where. To defrost, keep in the original wrapper and refrigerate overnight or immerse in cold water for three to four hours, changing the water often. Cook immediately after thawing. The package has instructions for roasting or broiling the hen. To roast, season and place breast-side up on a rack in a shallow roasting pan. Brush with melted butter. Roast at 375 degrees to an internal temperature of 180 degrees, basting often with butter. To broil, split lengthwise, season, and brush with melted butter. Broil until internal temperature reaches 180 degrees. I opted to roast our hens, and I served them alongside some stuffing, scalloped potatoes, and canned corn from Aldi, creating a sort of mini Thanksgiving dinner. 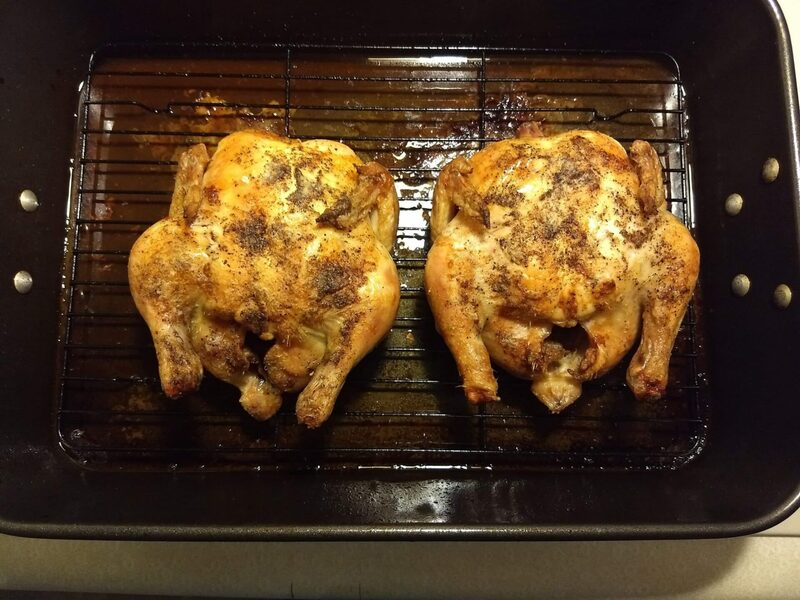 The directions do not give an approximate length of cooking time, but it took about an hour in the oven for my hens to reach 180 degrees. The hens, not surprisingly, taste just like regular chicken. 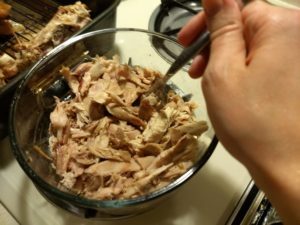 The crispy bits of the skins, which I sometimes nibble on after roasting a chicken, were especially delicious after roasting because they had been basted with melted butter, and I sprinkled them liberally with salt and pepper as well. 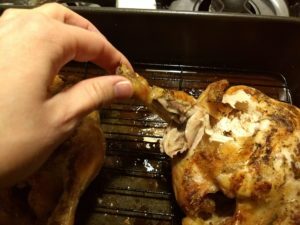 It was some of the best poultry skin I’ve indulged in. 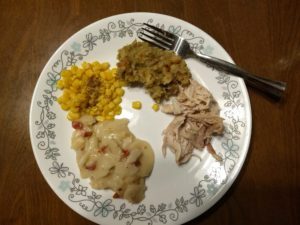 My husband and I each ate our fill, while our kids only wanted to eat just a little bit of the hens. At the end of the our meal, after I picked all the leftover meat off the two hens, I had enough meat to fill a 1.75-quart container halfway. It’s plenty of meat for one more meal. 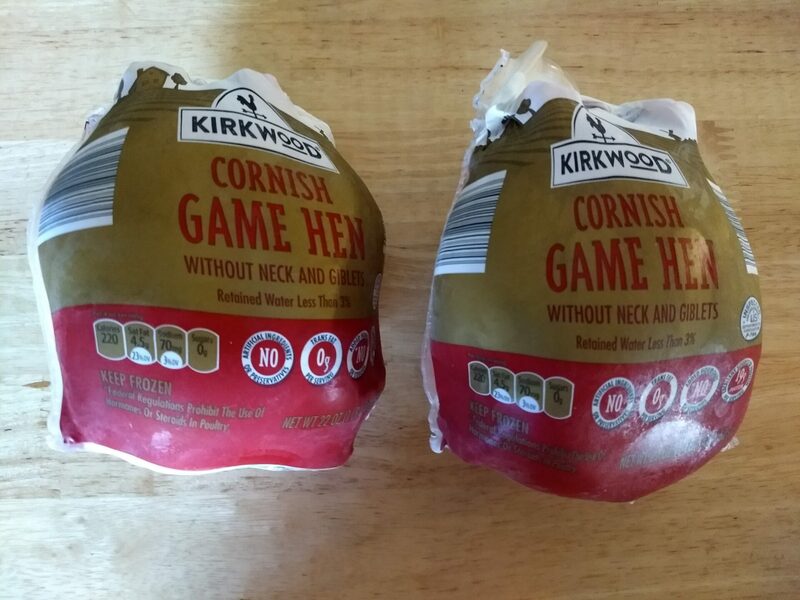 It’s probably a better deal to buy a regular, full-sized chicken, but I got more meat off of the two Cornish Game Hens than I expected. Aldi’s Kirkwood Cornish Game Hens are cute, petite, and tasty. They’re good if you’re feeding just a couple of people or a small family, and one hen is ideal if you are a single person wanting a home-roasted chicken dinner in a smaller size. They’re also a nice option if you want to impress dinner guests with their own personal birds.